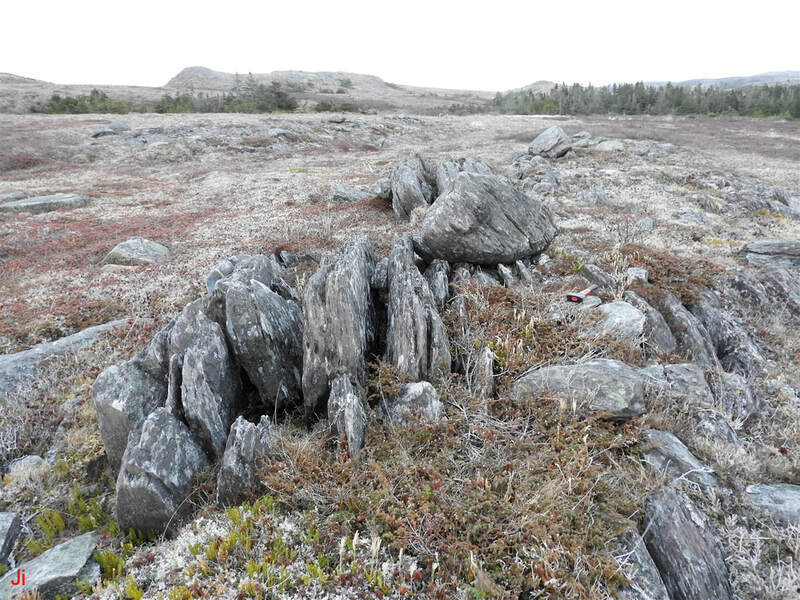 This section presents ten additional examples of erratics resting on frost-heaved bedrock. The intention in presenting these examples is to reduce ambiguity by including more observations and to widen the geographic extent of the observations. 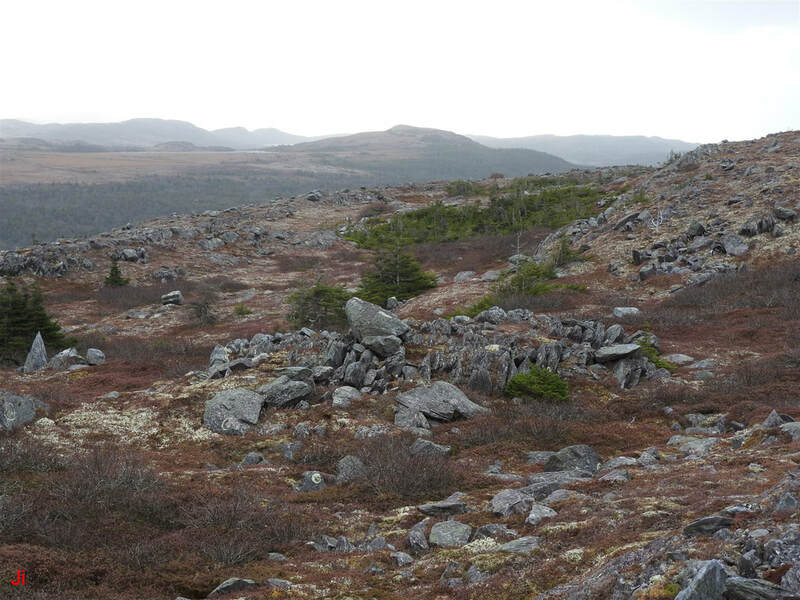 The overriding goal remains to support the theory that bedrock frost heave on the Avalon Peninsula occurred largely in a subglacial environment. 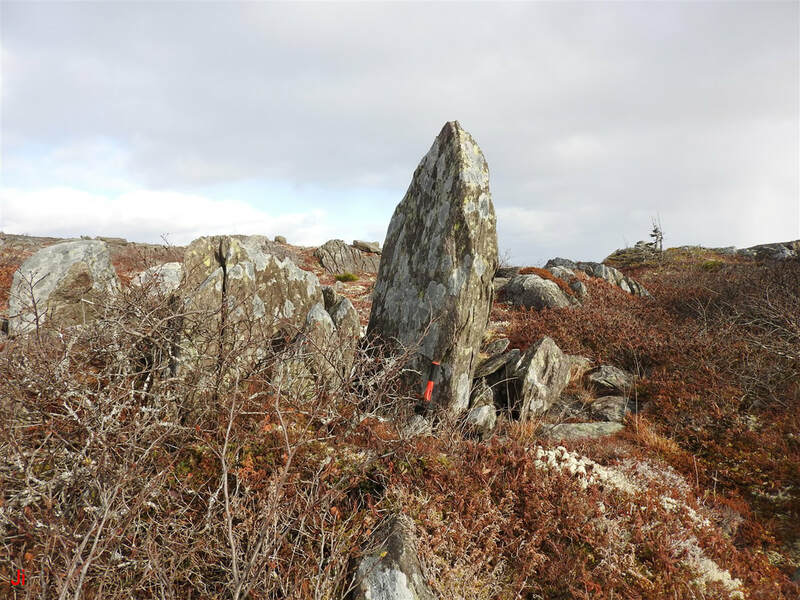 For an introduction to the analysis of erratics resting on frost-heaved bedrock, see Glacial Erratics and Bedrock Frost Heave: Event Sequencing - Part 1. 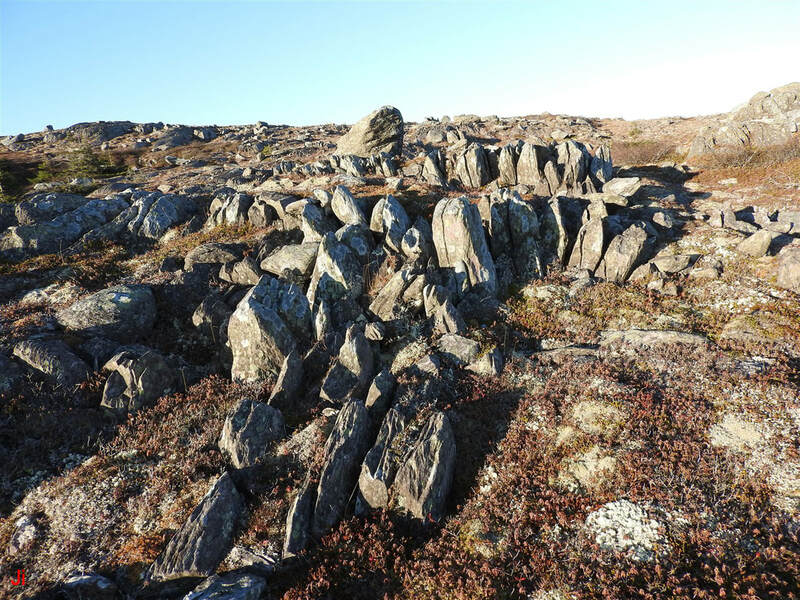 For two closely examined examples of erratics resting on frost-heaved bedrock occurring in areas of particular interest, see Glacial Erratics and Bedrock Frost Heave: Event Sequencing - Part 2. 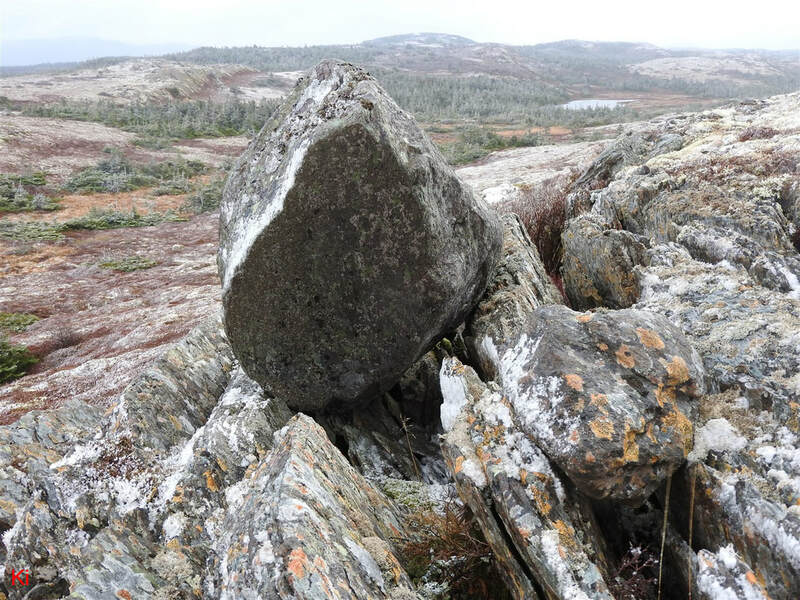 The above photo shows an erratic perched on an outcrop of frost-heaved bedrock. Observations of fissures between joint blocks and cavities beneath joint blocks taken at this location indicate that the erratic sits on a frost-heaved formation, not an eroded bedrock outcrop. Frost-heaved monoliths are abundant nearby as shown below. The erratic is seen in the first (left) photo above at the top center of the frame, behind a group of frost-heaved monoliths in the foreground. The second (right) photo shows a nearby large frost-heaved monolith. 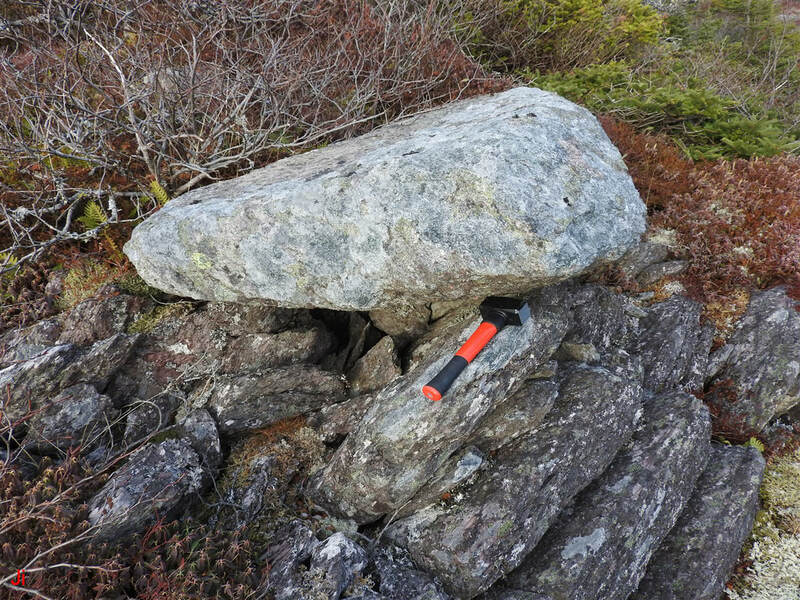 The above photo shows a frost-heaved joint block (behind the hammer) contacting the bottom of the erratic. The next two photos show this same joint block in more detail. 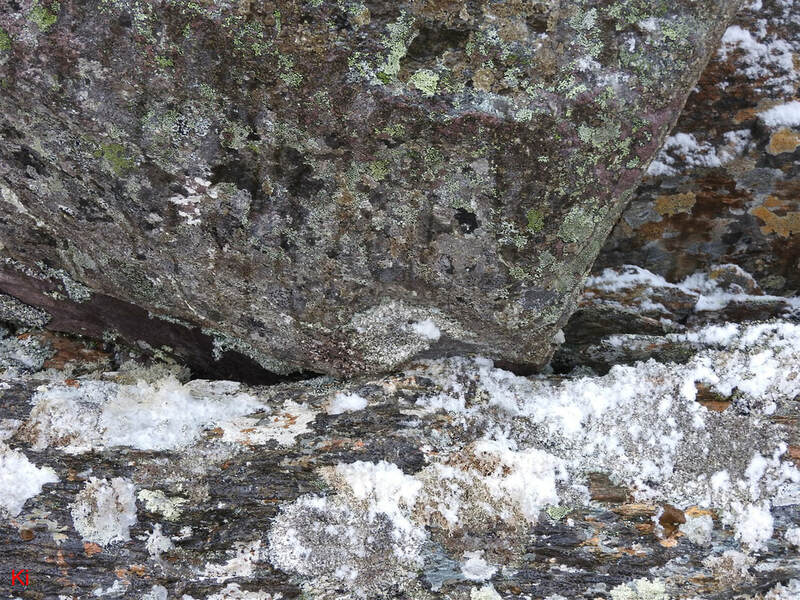 The above photos show a closely conforming contact indicating abrasion of the tip of the frost-heaved joint block by the bottom of the erratic. 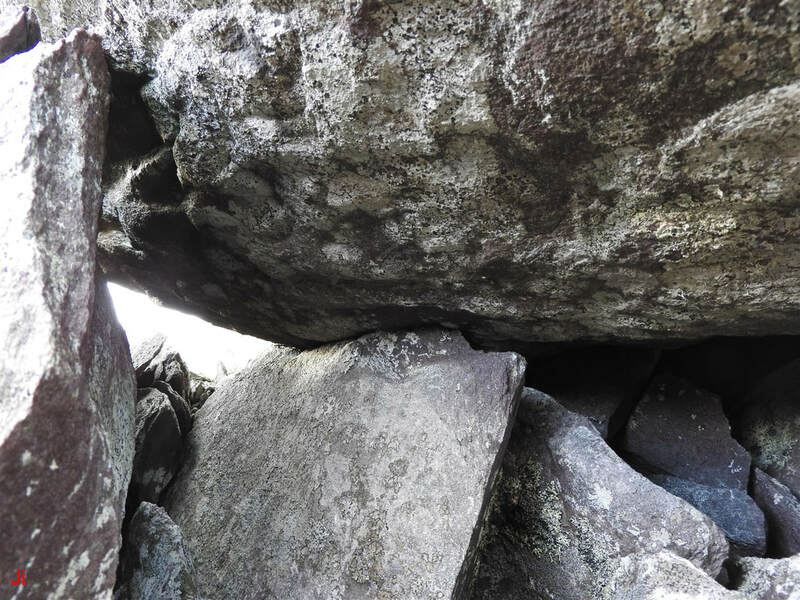 A second nearby frost-heaved joint block making a curved conforming abraded contact with the underside of the erratic is shown above. 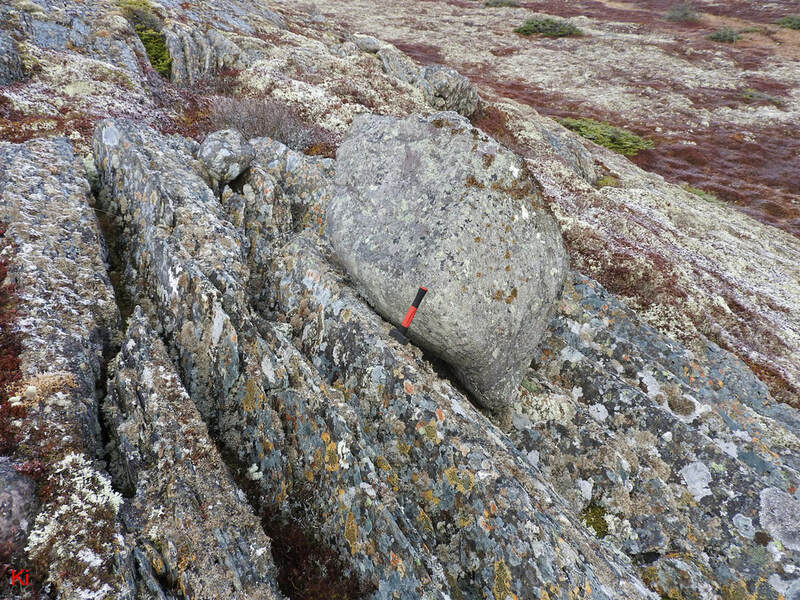 The two abraded contacts observed beneath the erratic suggest that the bedrock frost heave seen at this location predated the intrusion of the erratic and thus represents subglacial bedrock frost heave. The area of ice-disrupted bedrock seen surrounding the erratic (Example 03) in the above photo suggests that the erratic might lie near the center of a localized relict subglacial ice plume feature. The hammer seen in the above photo lies on a large frost-heaved monolith. The monolith is surrounded by deep fissures and underlain by a cavity. The rock resting against the frost-heaved monolith is an erratic. 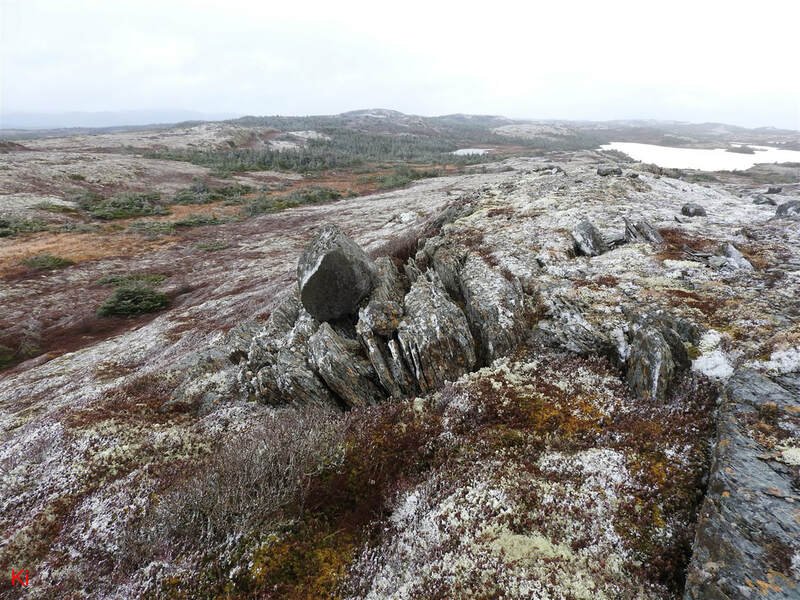 The area surrounding the site pictured above shows frequent occurrences of severely ice-disrupted bedrock with numerous large frost-heaved monoliths. The analysis of this site is ambiguous. There are three competing possibilities: 1) It is possible that the erratic was initially in place over top of the location where frost heave occurred. Then, when the monolith was forced upward, it jacked the erratic into its present tilted position. 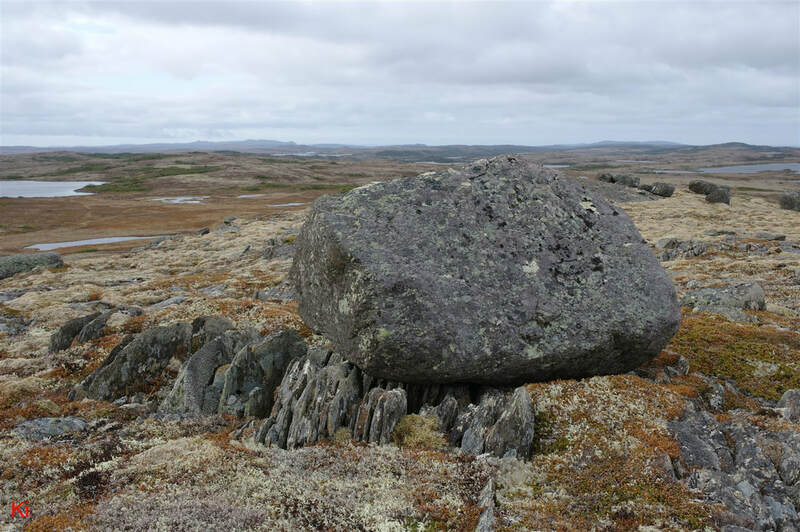 2) It is possible that the erratic was sitting on the slope beside the frost-heaved monolith when it split into two large sections (presumably during the Holocene), one of which toppled onto the frost-heaved monolith. 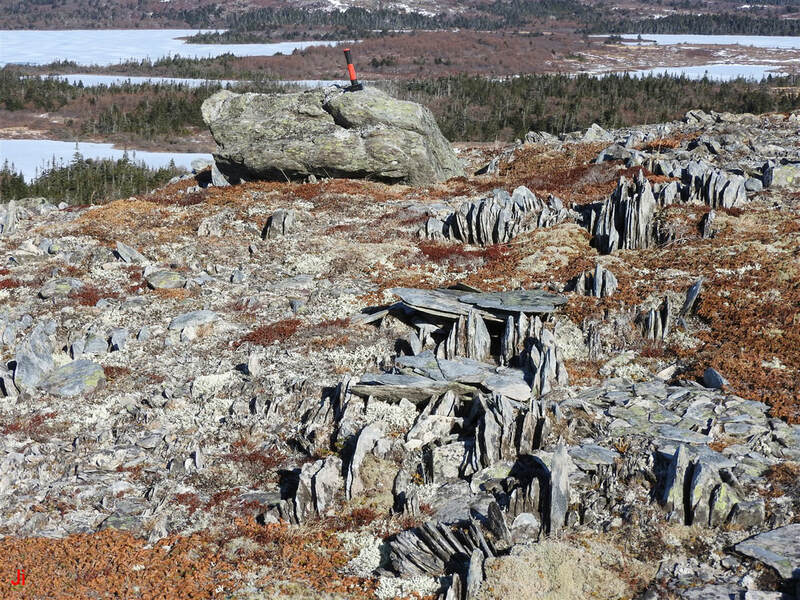 3) It is possible that the formation of the frost-heaved monolith predated the arrival of the erratic and that the present scene is the result of glacial deposition of the fractured erratic roughly as it now sits. 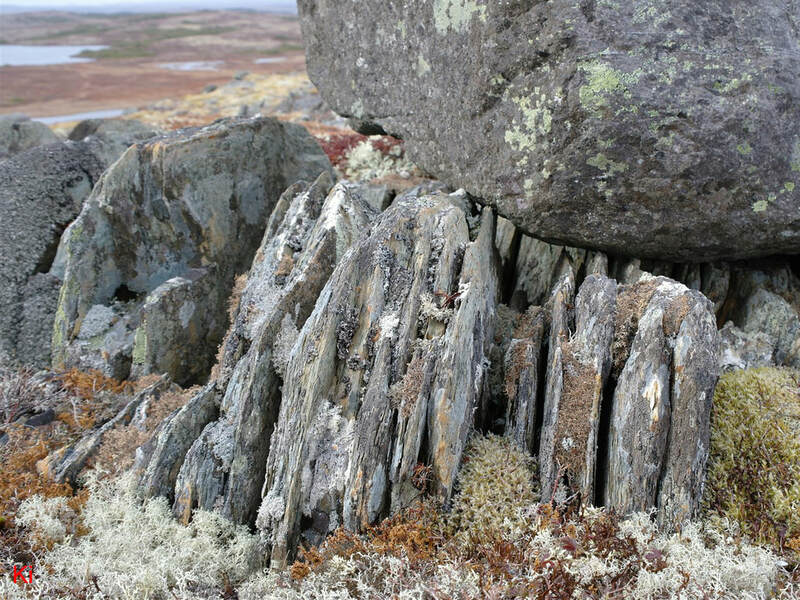 The breakage pattern illustrated above and the complex assembly of pinned fragments does not support the theory that the monolith jacked up the erratic as frost heave pushed the monolith upward in a subaerial environment. During a jacking-up process, some of the fragments now pinned in place by the load-bearing contact likely would have crumbled or fallen away. Furthermore, there was no observable abrasion mark on the erratic where the tip of the monolith might have dragged against the erratic. The theory that the frost-heaved monolith jacked up the erratic appears improbable in comparison with the two alternative explanations. The two pieces of the split erratic do not fit together well. 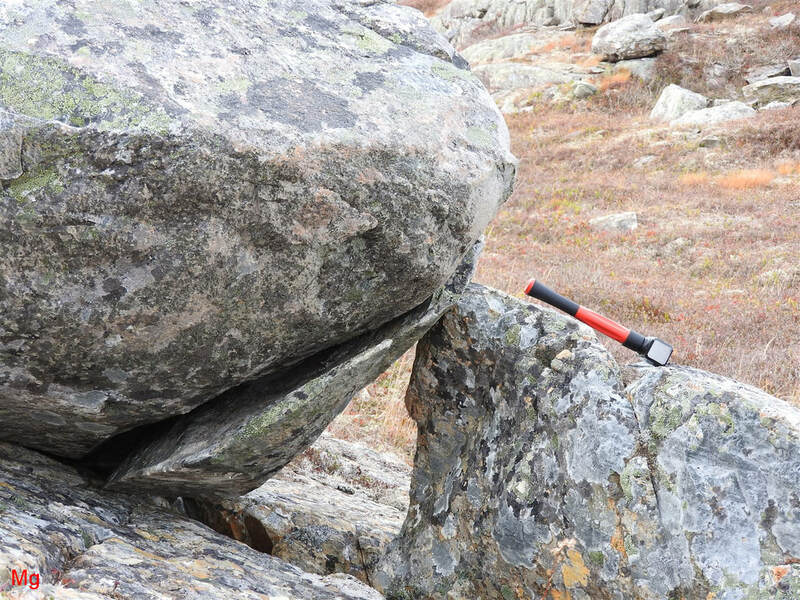 If the erratic broke apart because of Holocene freeze-thaw weathering, a good fit between the separated sections would be expected. Alternatively, if the mating surfaces were further eroded by Holocene freeze-thaw weathering, then the debris from this erosion should be visible on the ground between the separated pieces. The poor fit and lack of debris imply that the pieces separated during glacial transport, that is, prior to deglaciation. The theory that the origin of the large frost-heaved monolith predated the arrival of the erratic and hence represents an example of subglacial bedrock frost heave appears to be the more probable theory. 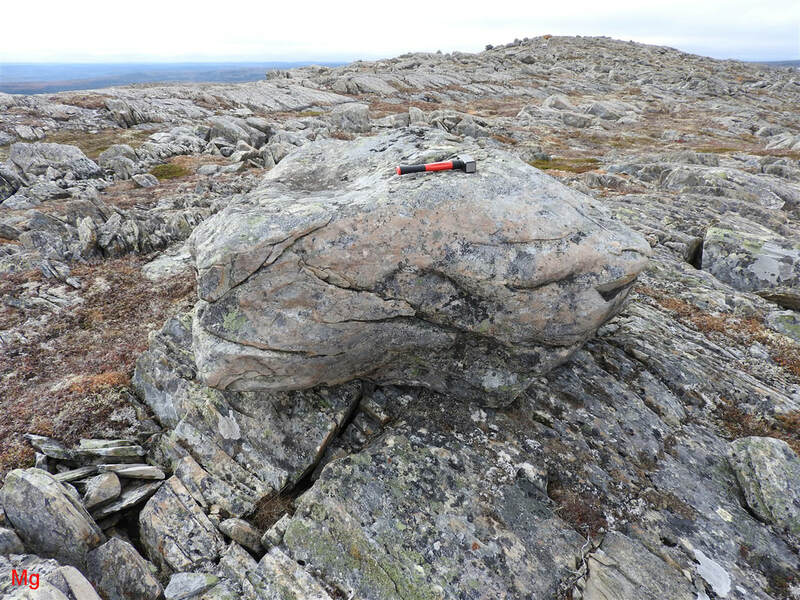 This example comprises a large erratic resting on a system of fissures that transition to bedrock frost heave with rotation. 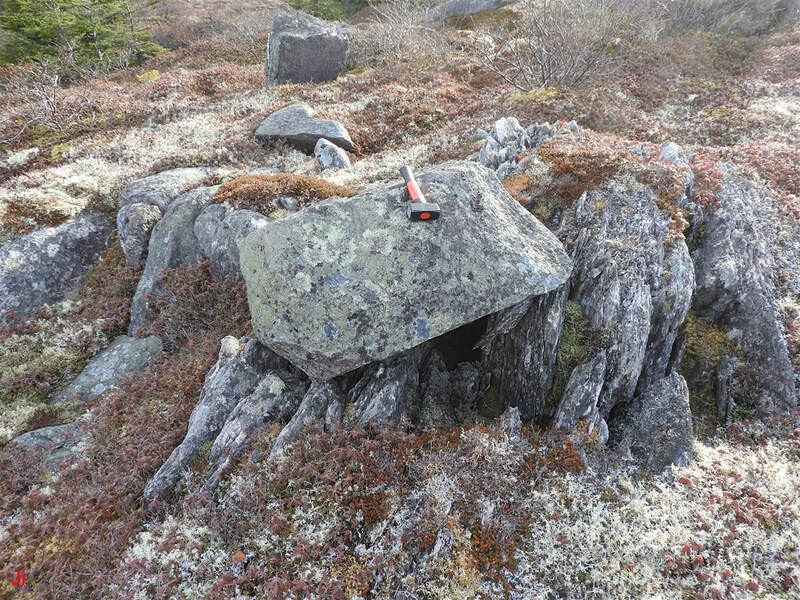 Interpretation of this layout is ambiguous because the erratic could theoretically have been present at the site while frost wedging occurred in a subaerial environment. An attempt to determine event sequencing at this location hinges on questioning whether joint blocks could shift underneath the erratic without dislodging the erratic (causing it to tip over or slide down hill) and without leaving behind observable abrasion marks. The system of fissures and the erratic are seen in the above wide-angle view. Note the frost-heaved monoliths protruding from the ridge just to the right of the fissures. Views of the erratic from four different directions are shown above. 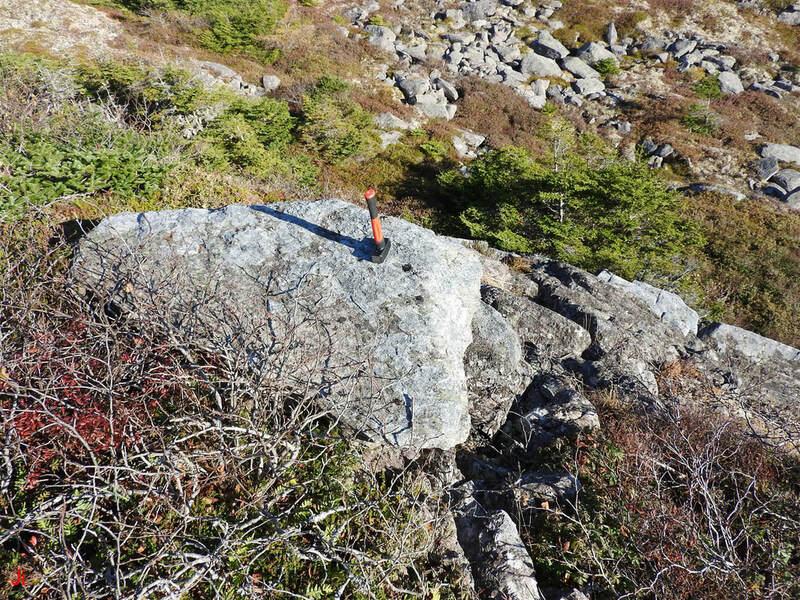 It appears unlikely that the observed frost wedging could have occurred beneath the erratic without leaving erosion marks on the large joint block that now supports the weight of the erratic. 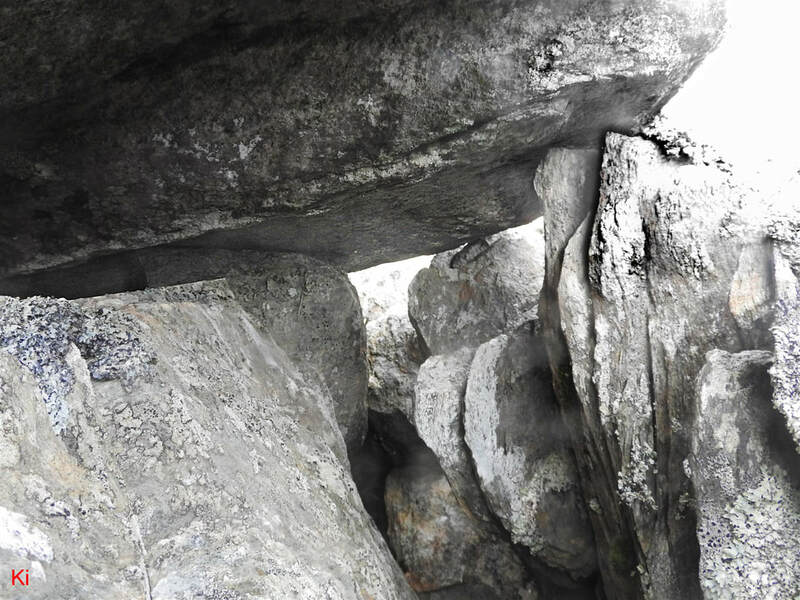 A closeup view of the main load-bearing point of contact between the erratic and the joint block supporting the erratic shows no obvious sign of erosion where the supporting joint block might have dragged against the overlying boulder. If it is assumed that the fissure system and associated frost-heaved bedrock features were formed prior to the arrival of the erratic, then a question remains as to whether the observed features stem from plucking by a warm-based glacier. Views of opposite sides of the ridge hosting Example 05 are shown above. Similar systems of fissures grading over into bedrock frost heave with rotation are seen on both sides of the ridge. Without reversing its direction of flow, a warm-based glacier would not be expected to account for rock shifts via plucking in 180 degree opposite directions. If glacier flow direction were to reverse, a previously formed disrupted-bedrock feature such as is illustrated in one or the other of the above photos would be significantly modified or obliterated. Many additional ice-disrupted bedrock features, including tall, thin (hence fragile) frost-heaved monoliths are seen along the ridge. These features would not survive significant glacial ice flow tangential to the ground. In conclusion, either the fissure system and rotated bedrock frost heave described in this Example 05 are of subaerial origin (considered unlikely in view of the placement of the erratic) or else the features were formed under an approximately stationary ice sheet. If the features formed under a stationary ice sheet, then the ice flow causing the bedrock shifts emanated from within the ridge and this ice flow was mainly non-tangential to the ground. 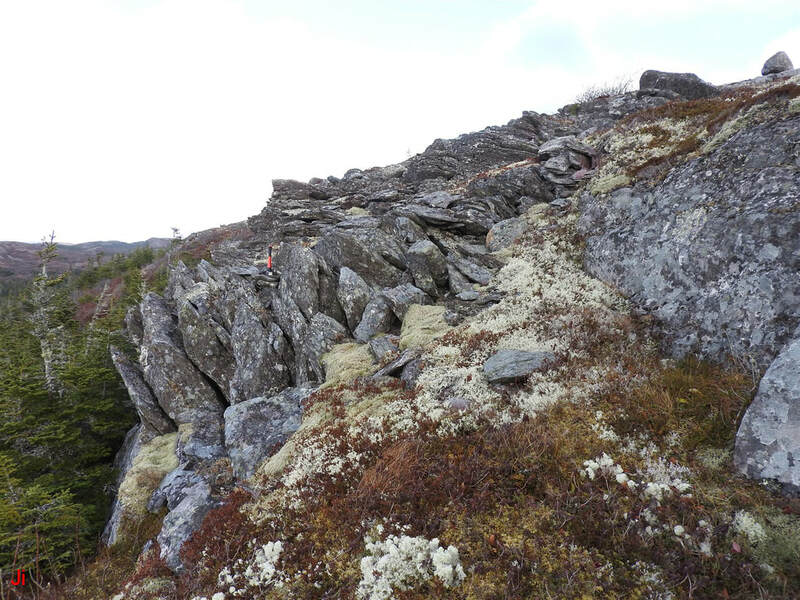 An erratic is seen to the left of center in the first (left) photo above, lying at the top of a sloping area of bedrock frost heave with rotation. 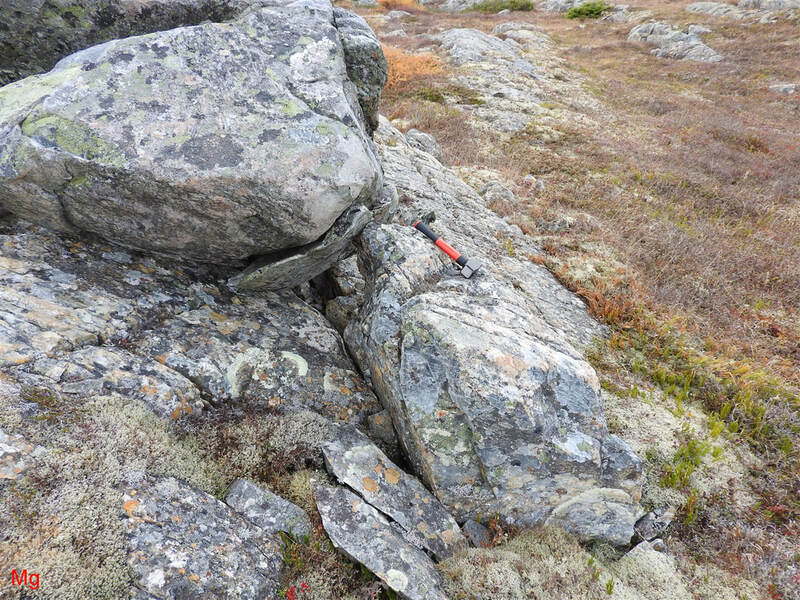 In the second (right) photo above, a hammer can be seen positioned on the rocks about half way down the slope below the erratic. The erratic rests on frost-heaved bedrock. On preliminary analysis, this hillside site might be interpreted as an instance of glacial plucking. The same argument that was used in the preceding Example 05 can be used here to suggest that plucking caused by the unidirectional flow of a glacier is an unlikely explanation for the bedrock disruption. The photo below shows a similar rotated bedrock frost-heave feature located nearby, on the opposite side of the ridge hosting the above-pictured feature. The observation of two nearby instances of bedrock frost heave with rotation, where the shift-directions of the tops of the rotated slabs differ by 180 degrees, reduces the viability of a conventional "glacial plucking " explanation. Unidirectional glacial flow and associated ice pressure reduction would not simultaneously explain oppositely-directed frost-wedging events. A subaerial origin, whereby the features were formed by frost wedging driven by meteoric moisture and periglacial climate conditions remains a possibility. 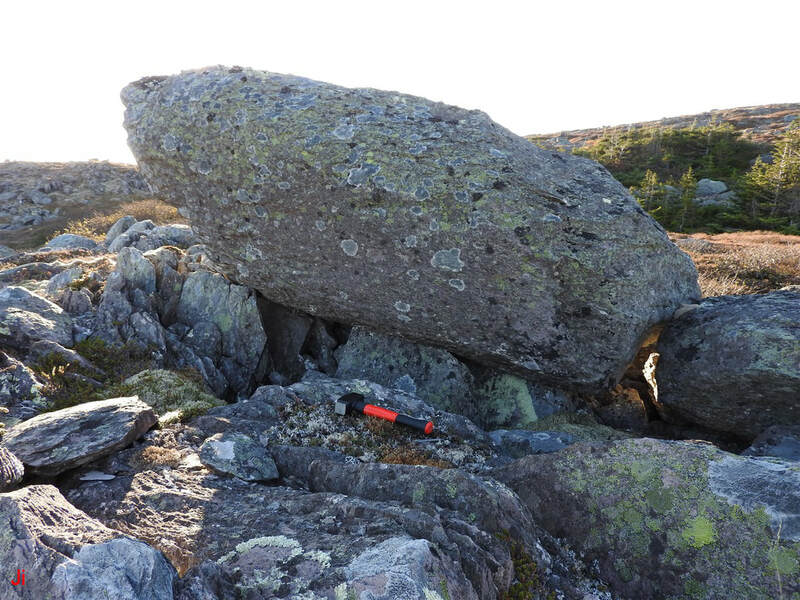 However, it will be argued below that the previously mentioned erratic seen resting on rotated frost-heaved bedrock works against any explanation that does not include the presence of an overlying glacier. 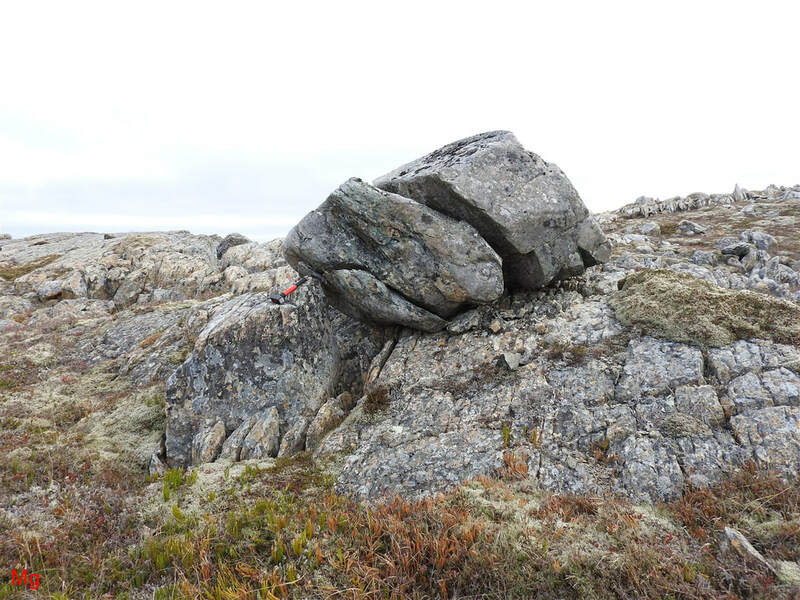 The above picture shows the erratic (Example 06) perched at the top of the ice-disrupted bedrock feature. The rotated frost-heaved joint block seen beneath the hammer in the above photos lacks sufficient clearance to allow its present orientation to be attained with the erratic in place. 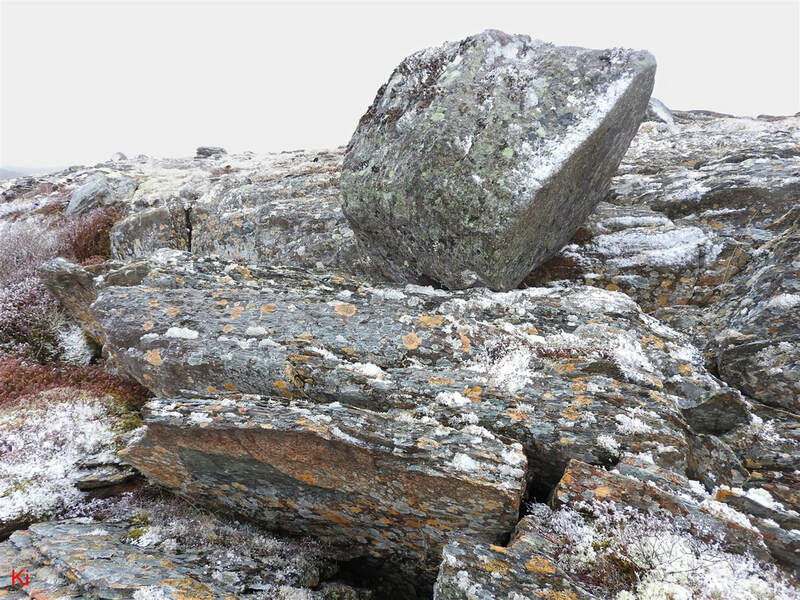 The above photo shows the small amount of clearance between the rotated frost-heaved joint block and the overlying erratic. The direction of rotation of the block is top towards the camera. Another joint block is visible adjacent on the right. This block is pinned beneath the erratic and bears part of the weight of the boulder. The two joint blocks appear to be comprised from a single block that fractured and divided into two pieces. 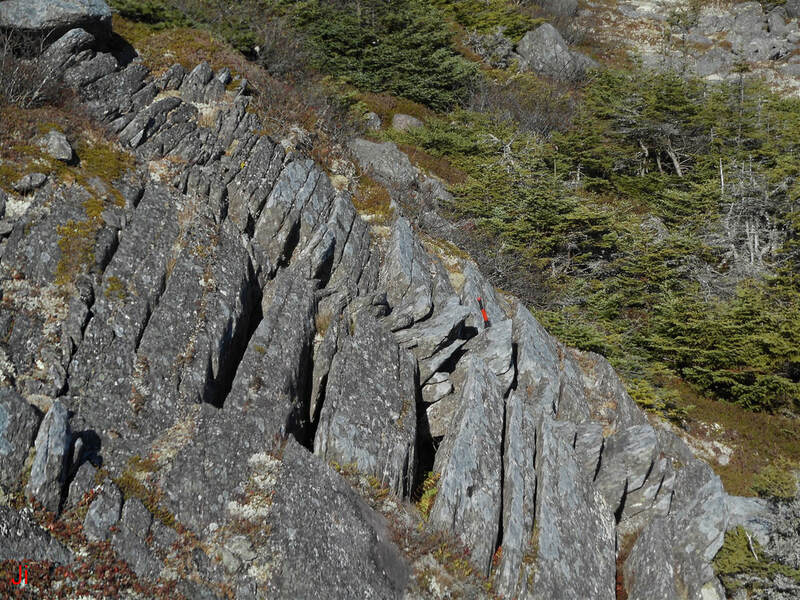 Although the rotation of the joint blocks was presumably caused by ice flow, not by the intrusion of the erratic, the presence of the erratic weighs against a subaerial origin for the illustrated frost-heave feature. 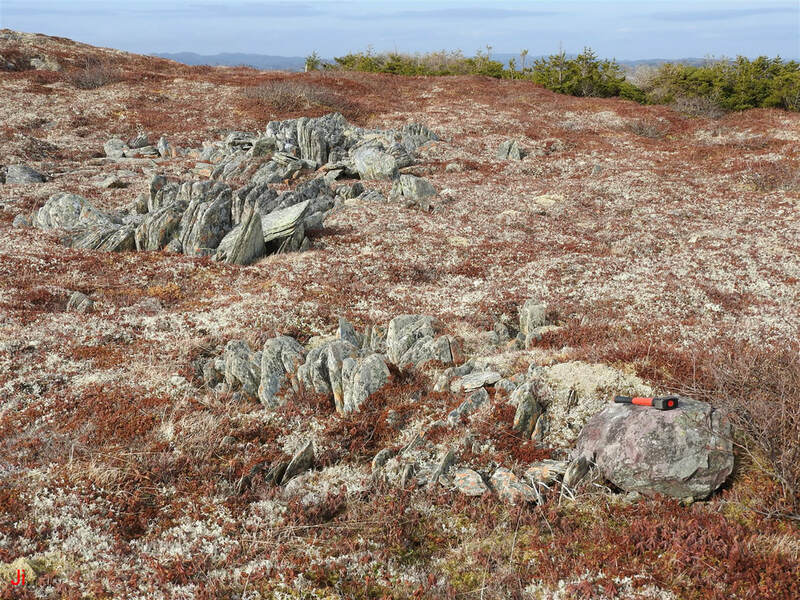 The feature appears best described as a subglacial bedrock frost-heave occurrence in line with other similar occurrences of bedrock frost heave with rotation seen on the Avalon Peninsula. 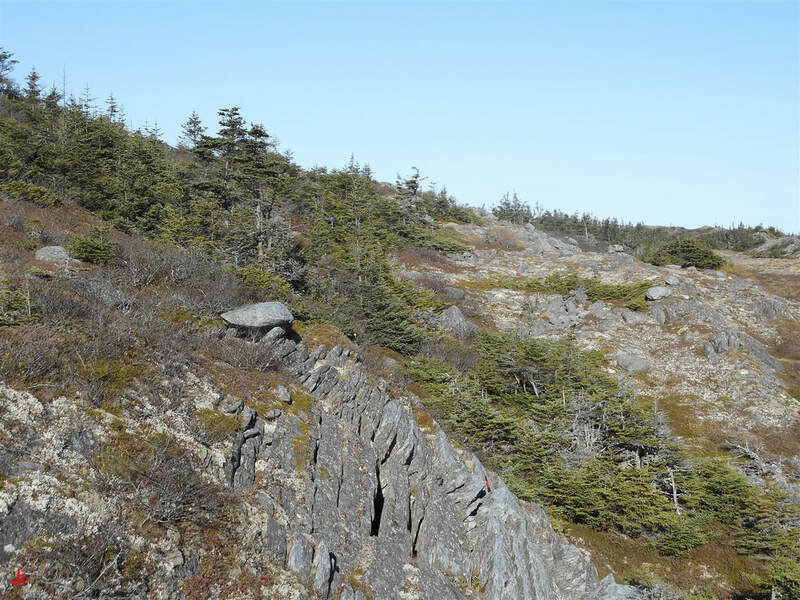 The erratic seen above lies in an area showing abundant outcrops of layered frost-heaved bedrock. 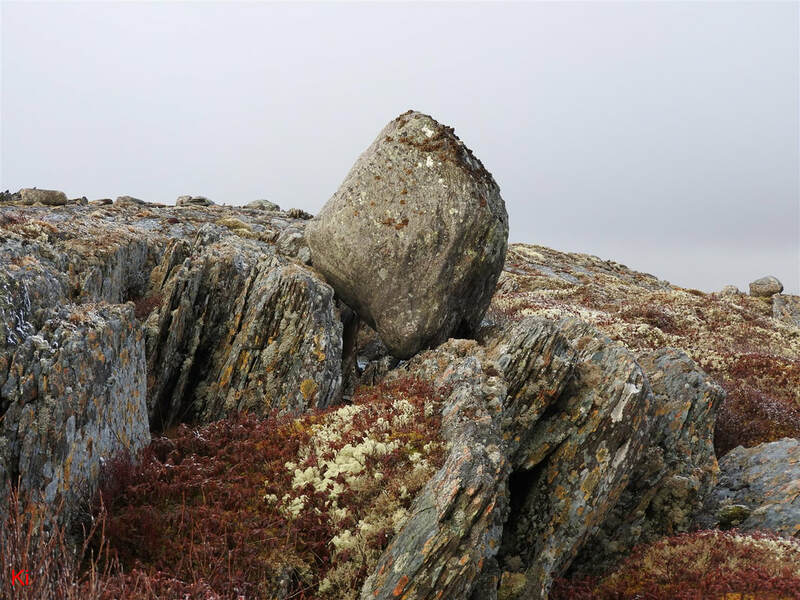 As seen below, the erratic rests on top of a row of small, fragile frost-heaved monoliths. Because of the large number of support points, the weight of the erratic was insufficient to crush any of the individual frost-heaved blocks beneath the boulder. Accordingly, this occurrence cannot be interpreted unambiguously. 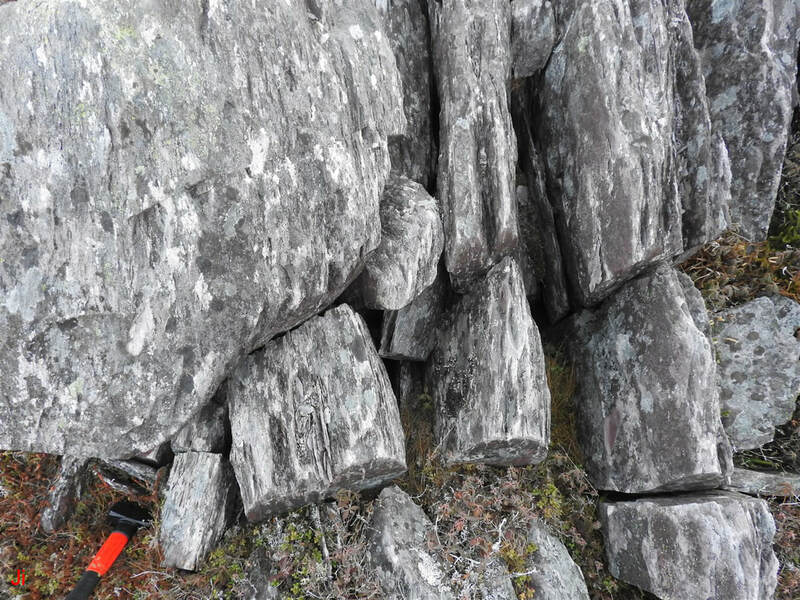 The best evidence that bedrock frost heave occurred before placement of the erratic is seen above, where some of the individual joint blocks beneath the erratic appear to have been rotated by up to 45 degrees. 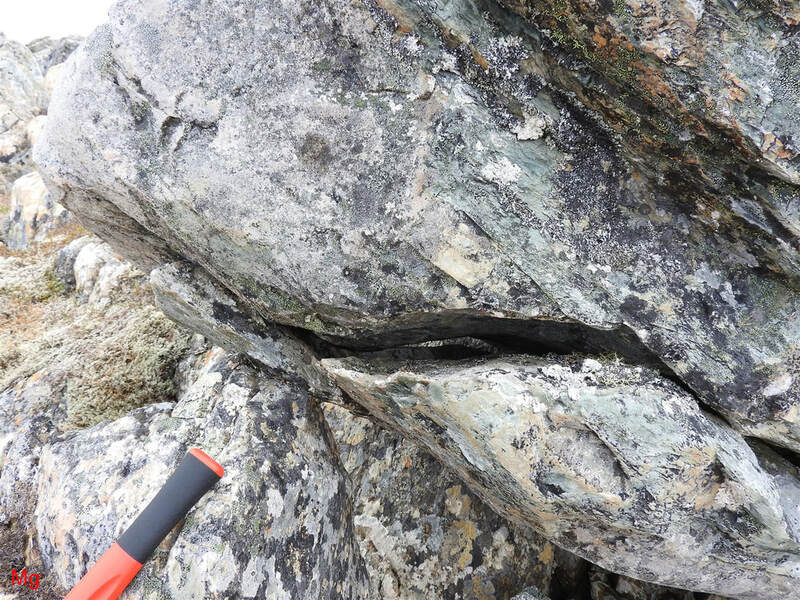 However, this rotation is seen in only a few small frost-heaved joint blocks, and many others remain approximately vertical as shown below in a view from the other side of the boulder. 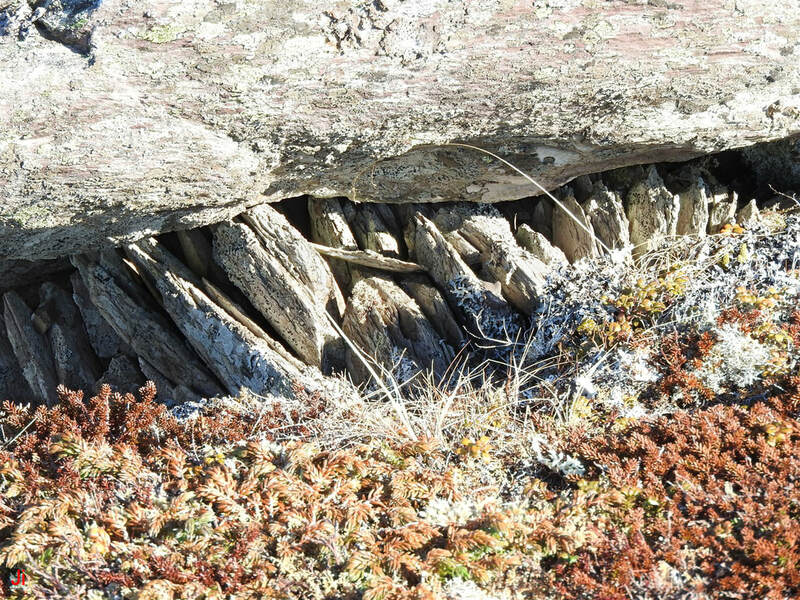 The above photo shows frost-heaved joint blocks supporting the weight of the erratic. 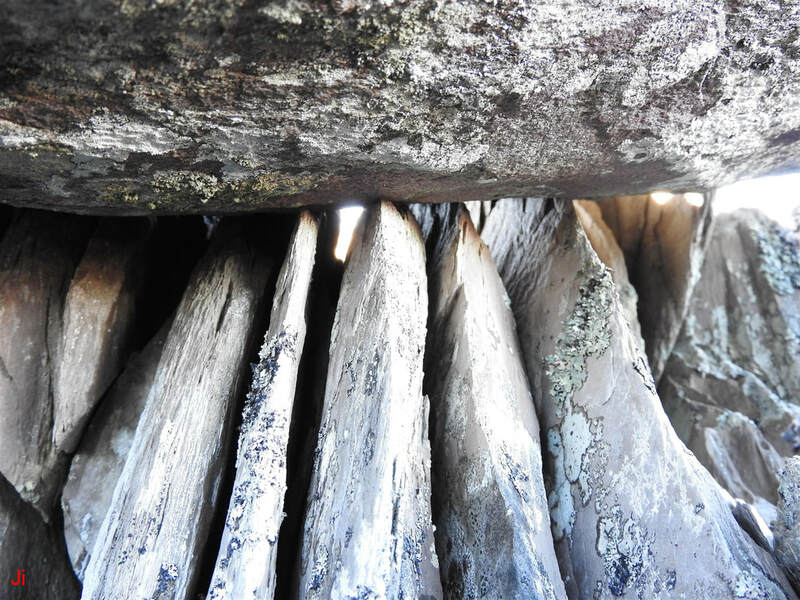 No clear indication of abrasion was observed on the tips of the supporting fragments. The erratic boulder seen at this site could have settled onto a pre-existing row of frost-heaved blocks (subglacial frost heave action), pressing some of the supporting blocks back down into substrate, or the fragments could have jacked up the erratic as they were pushed upward from bedrock by subaerial frost heave action. The example illustrated above has many characteristics in common with the previous Example 07. 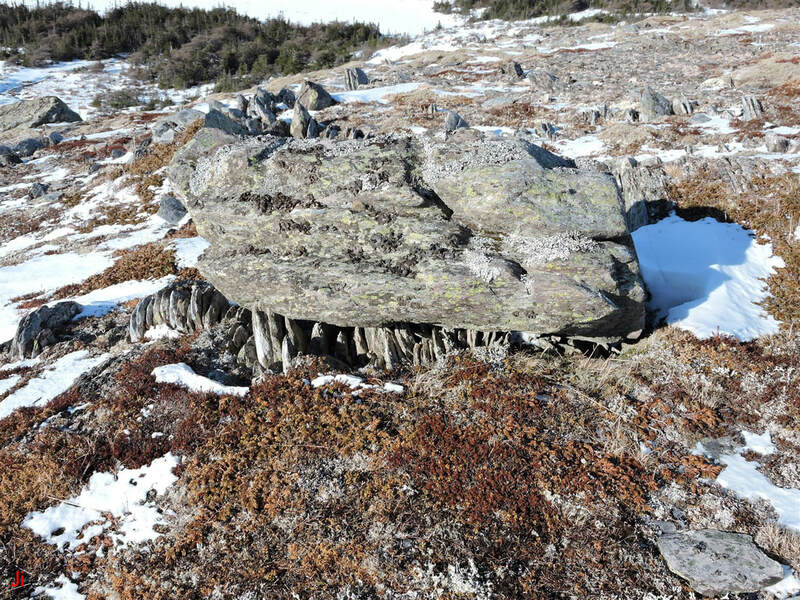 The erratic rests on many small blocks of frost-heaved bedrock and it is unclear whether the erratic settled on pre-existing frost-heaved blocks of subglacial origin, or whether the blocks were pushed up from bedrock in a subaerial frost heave event, jacking up an erratic left behind after deglaciation. The above photos show contacts between individual frost-heaved joint blocks and the overlying erratic. There is no clear evidence of abrasion on the tops of the blocks nor of rotation of frost-heaved joint blocks about horizontal axes. The fourth (bottom, right) picture shows a view taken underneath the erratic at the opposite corner of the boulder from the view shown in the first (top, left) photo. 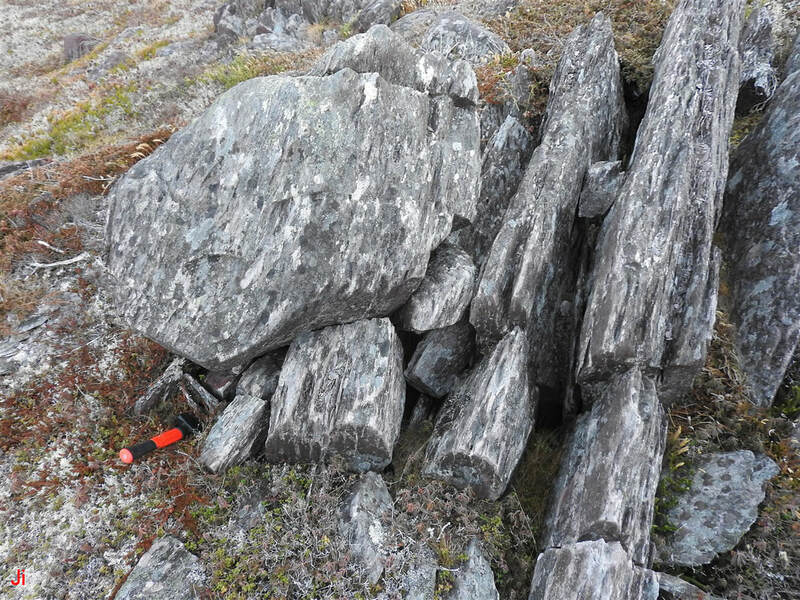 The ice-induced disruption of the bedrock is more severe at the location shown in the fourth (bottom, right) photo, and some of the joint blocks appear disorganized or to have rotated about a vertical axis. 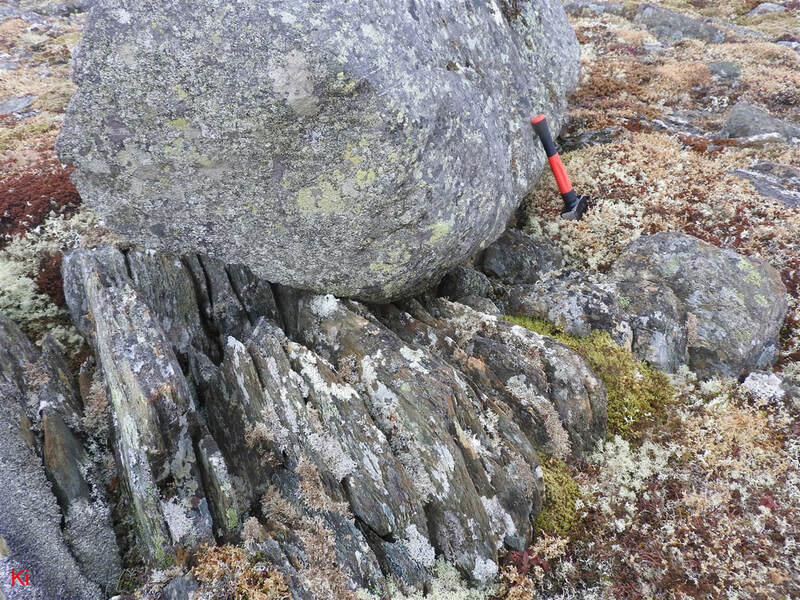 If it can be assumed that the presence of the erratic would have interfered with any part of the observed bedrock disruption, then such an assumption would point toward a subglacial origin for the frost-heave seen at this site. 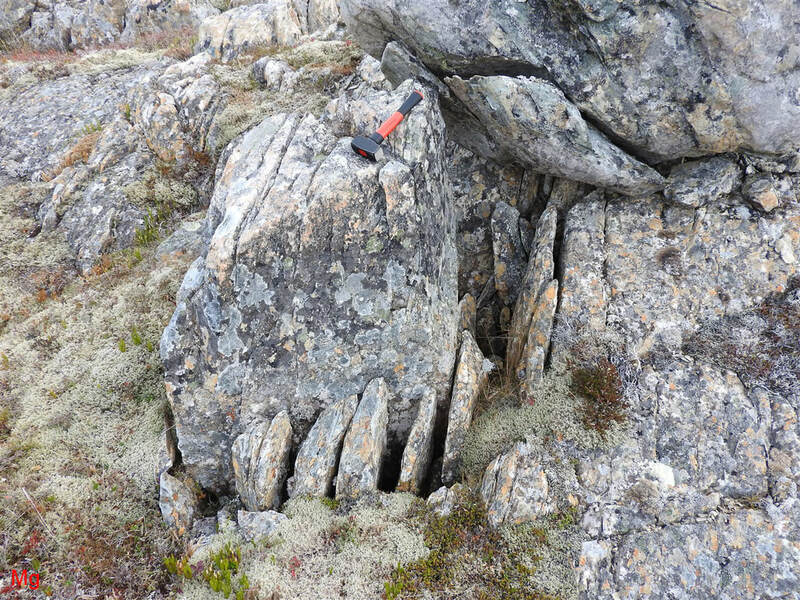 The erratic seen in the above photo lies in a large area of exceptionally severe ice-induced bedrock disruption. 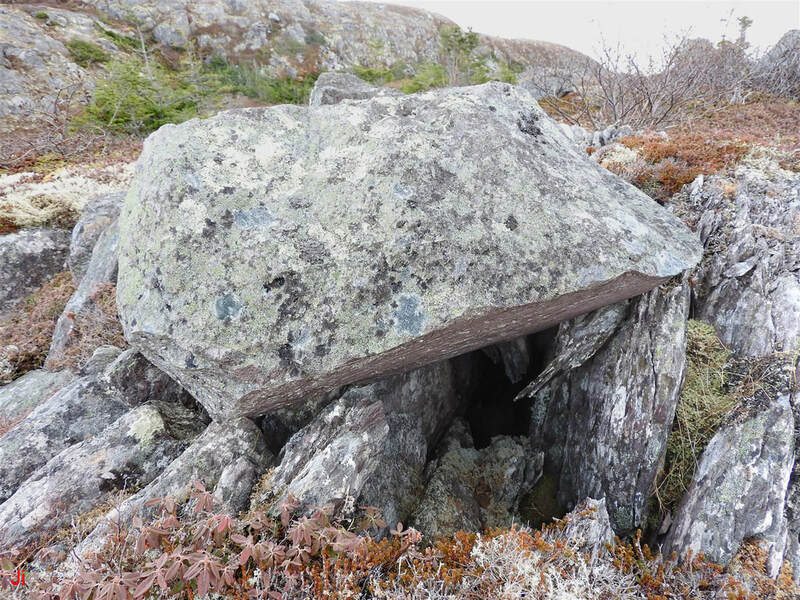 The rock comprising the erratic closely matches local bedrock, and it is likely that this "erratic" was sourced from bedrock near to its present location. 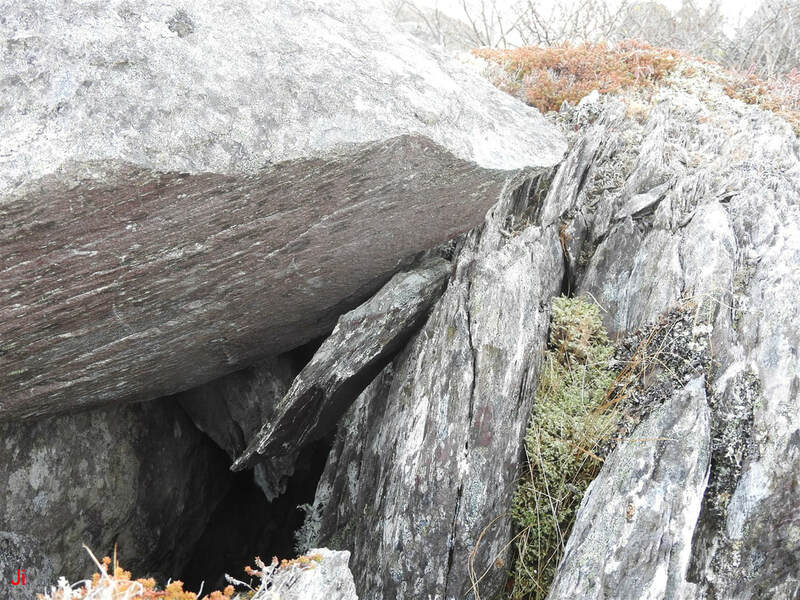 A shallow fissure can be seen extending from the left foreground of the photo to a point underneath the erratic. A row of small, loose joint blocks lies within this fissure. The fissure has apparently resulted from joint blocks dropping back downward after large-scale frost heave of the adjacent bedrock. A closer view is shown below. It is apparent that the trend of the joint blocks in the fissure is to increase in height approaching the erratic. 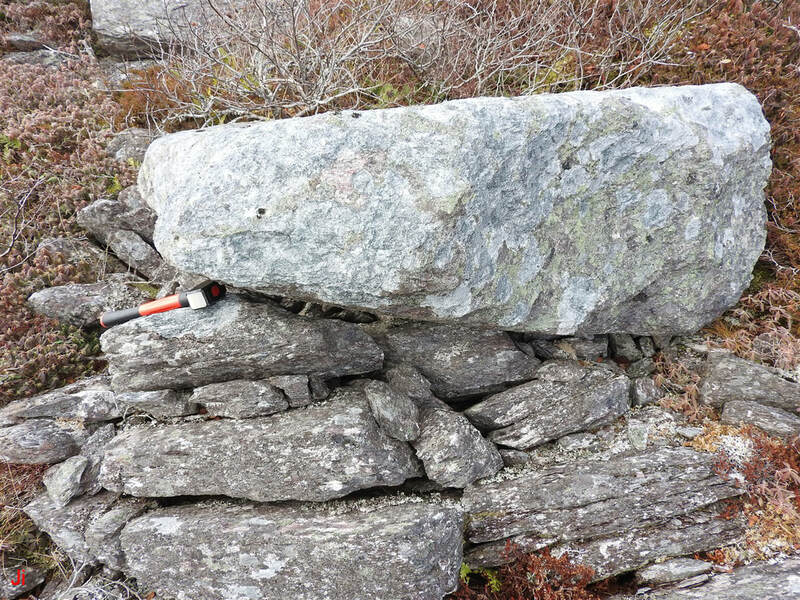 The photo below shows a rotated joint block pinned underneath the erratic. The joint block seen in the center of the above frame appears to have been rotated by contact with the overlying erratic. The theory that seems best suited to explaining observations at this site (Example 09) involves an assumption of subglacial frost heave. An ice lens developed beneath a multi-square meter section of bedrock, lifting the section upward a few centimeters. This action occurred in a subglacial environment, prior to deposition of the erratic. As glacial ice thinned and departed, the erratic was deposited on bedrock underlain by the ice lens and, upon melting of the ice lens, by a void. The weight of the erratic pushed underlying bedrock downward unevenly, leaving raised bedrock on the side where the fissure is now seen. A row of joint blocks dropped down into the underlying cavity, forming the fissure. The small joint block seen rotated beneath the erratic was prevented from fully descending by underlying debris. If the above-described theory is valid, then the observations at this site (Example 09) can be used in support of other nearby observations indicating that all ice-disrupted bedrock seen in the local area originated in a subglacial environment. 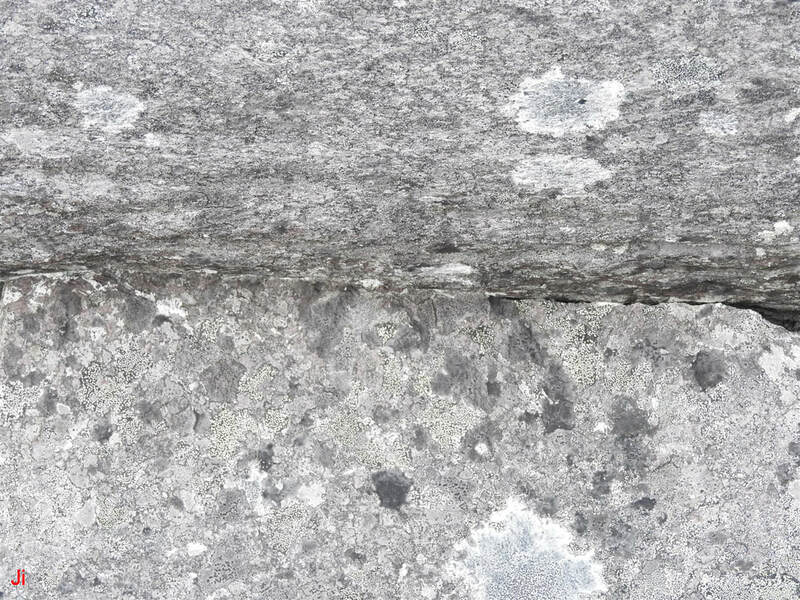 The erratic shown above lies on top of a row of frost-heaved joint blocks. 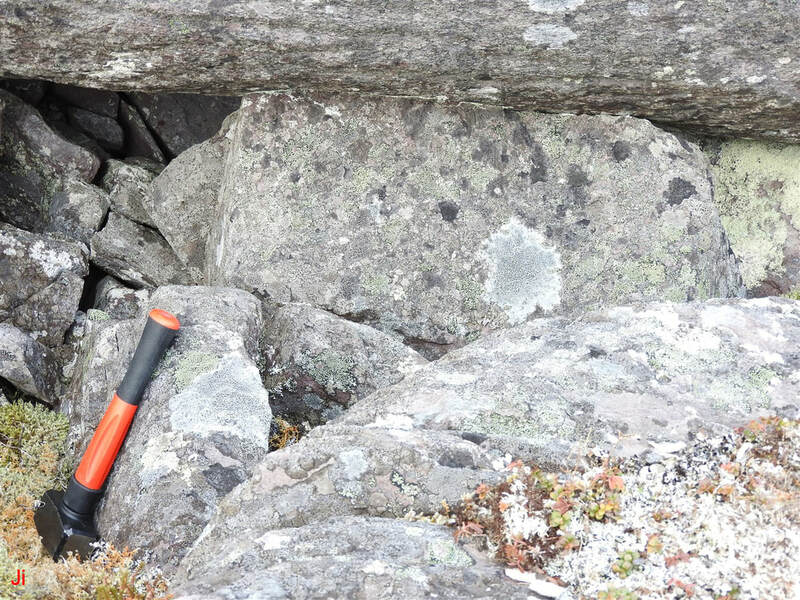 A gap seen beneath the erratic (almost straight down from the hammer) marks the location of a sunken frost-heaved block that has dropped part way back into its underlying cavity. The two photos above show closer views of the gap between frost-heaved joint blocks underneath the erratic. 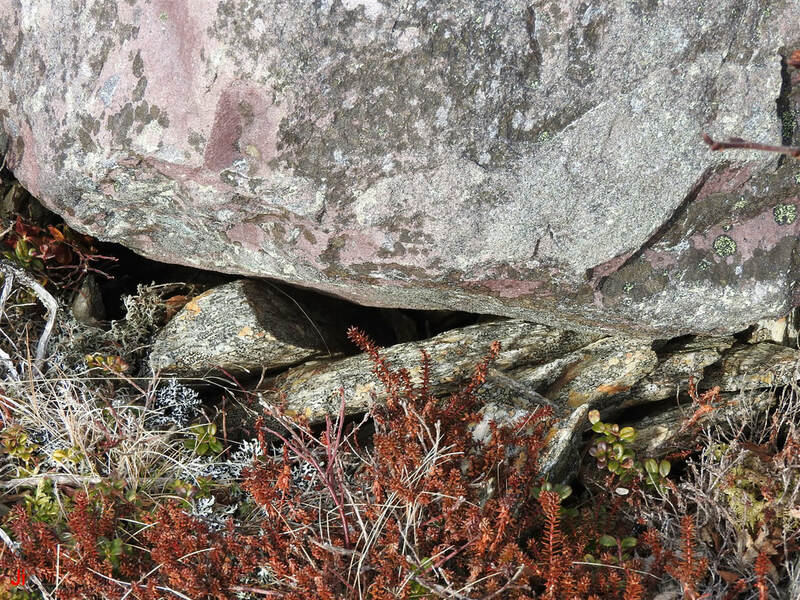 Broken pieces of rock can be seen wedged between the erratic and two of the frost-heaved joint blocks that are supporting the weight of the overlying boulder. 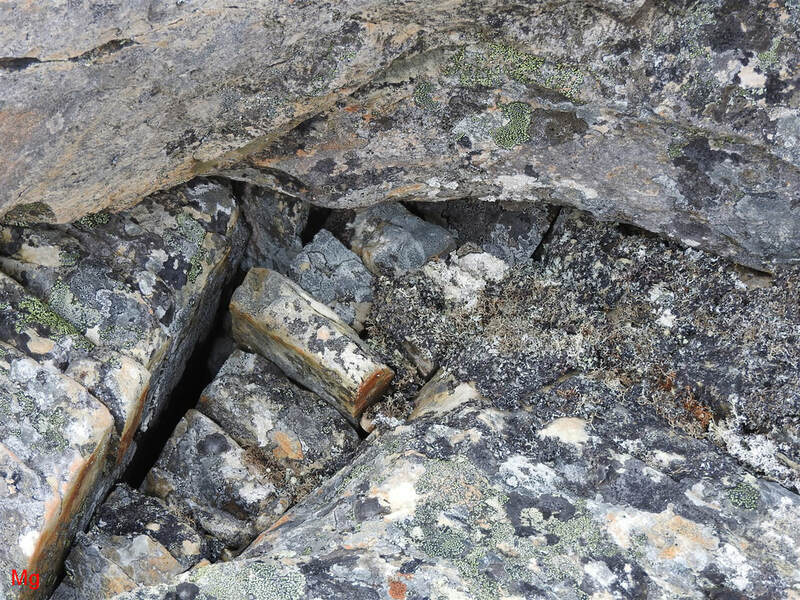 It appears that these broken fragments are associated with the collapse of the rock between the two supporting blocks. A question arises as to whether the observed geometry of this occurrence might represent a consequence of subaerial frost heave taking place after the erratic was settled. This possibility competes with an alternative explanation whereby the sequence of events might be: 1) Subglacial frost heave lifts a row of joint blocks. 2) The erratic settles into position as overlying ice melts. 3) A gap is formed when one joint block falls back into the underlying cavity after ice melts. 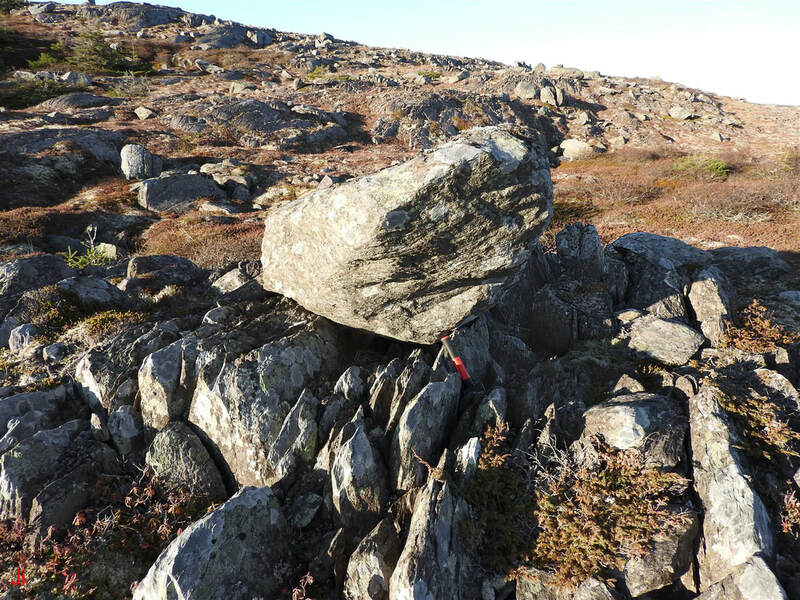 4) Detached fragments of rock remain pinned in place by contact with the erratic. 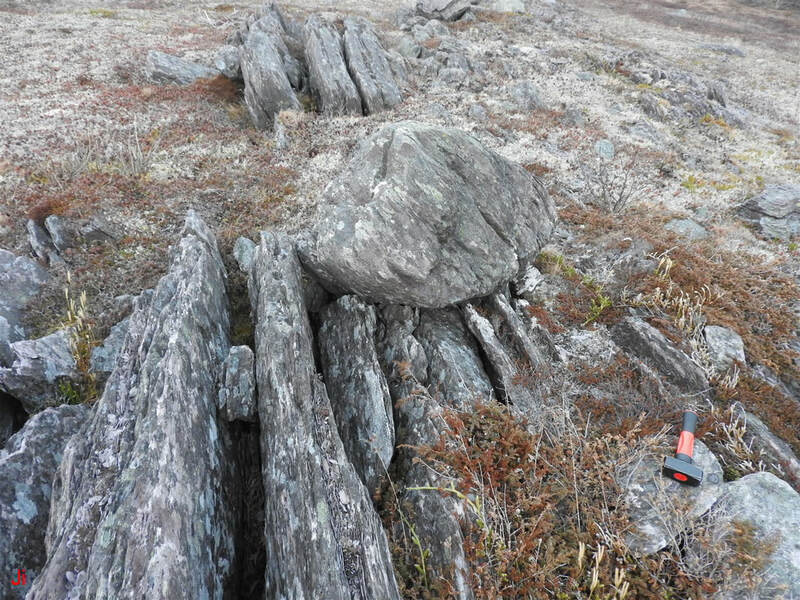 The above photo (taken from the side of the erratic facing opposite to that shown in the first three photos) shows the complexity of the bedrock disruption at this site, Example 10. There have been horizontal, as well as vertical, displacements of bedrock sections by a combination of frost wedging and/or the action of moving glacial ice. Because of the complexity of the ice-induced bedrock disruption observed at this site, interpretation of the site to yield event sequencing remains ambiguous. 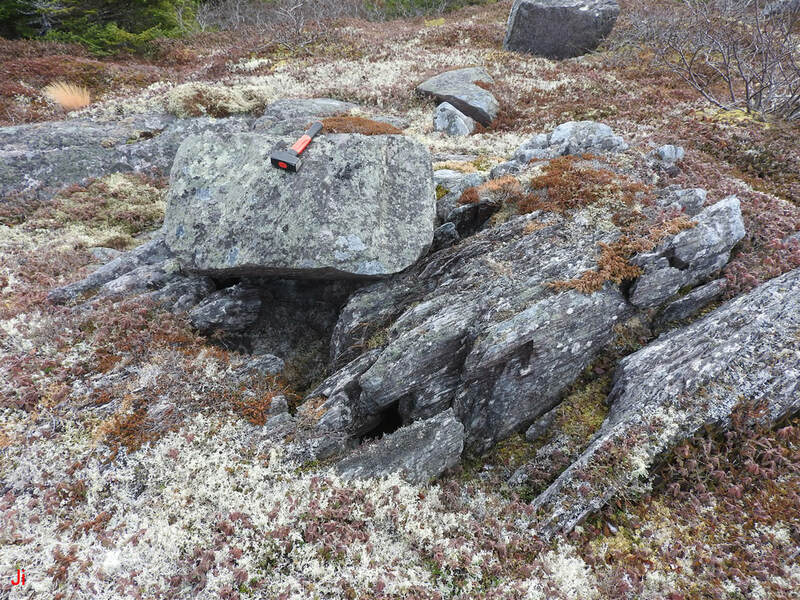 The "erratic" seen above and to the right of the hammer in the above photo is similar in composition to adjacent frost-heaved bedrock and appears to have been sourced in the immediate area. Viewed from the opposite direction, as seen in the following photo, it is apparent that the boulder did not result from frost heave occurring directly beneath the point where it now sits. As seen in the above view, the boulder under consideration appears to have been glacially transported. The possibility that the boulder originated via frost heave within the local outcropping of frost-heaved bedrock cannot be excluded. The wider view shown below emphasizes this possibility. If the boulder resulted from local frost-heave action, then the frost heave action occurred in a subglacial environment. A closeup inspection of rock shifts seen near the boulder supports this theory. 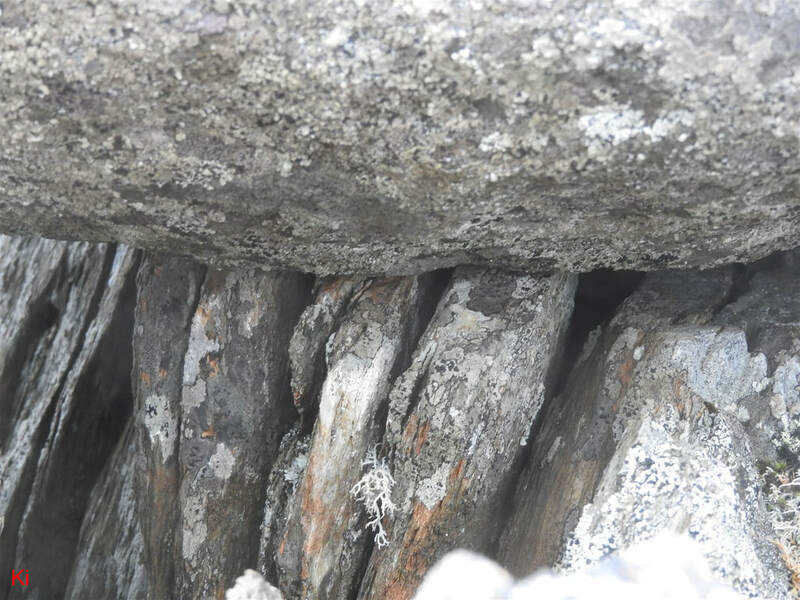 The above photo shows a line of frost-heaved joint blocks that has been shifted out of alignment by contact with the intruding boulder. 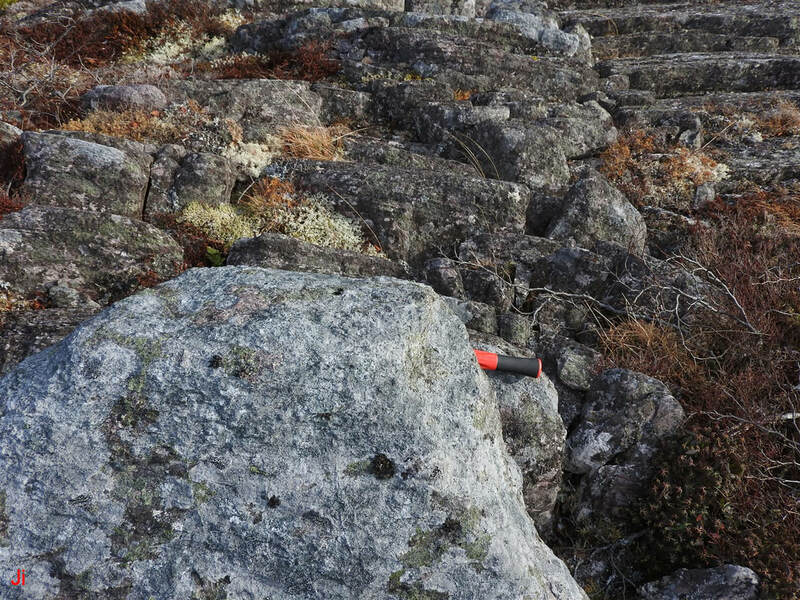 This arrangement suggests that frost heave occurred before the boulder assumed its final position, indicating that the frost heave was a subglacial occurrence. 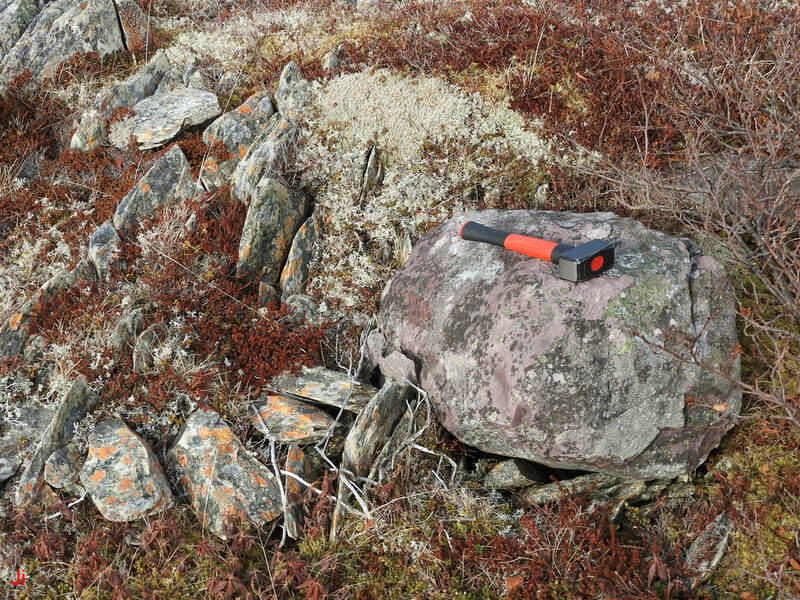 In the above photo, a hammer can be seen lying on a small erratic that rests on fragments of frost-heaved bedrock. The frost-heaved bedrock occurrence seen in the background is one of a group of several conspicuous localized occurrences found in the immediate area. Each of these occurrences could represent an instance of subglacial ice plume activity. 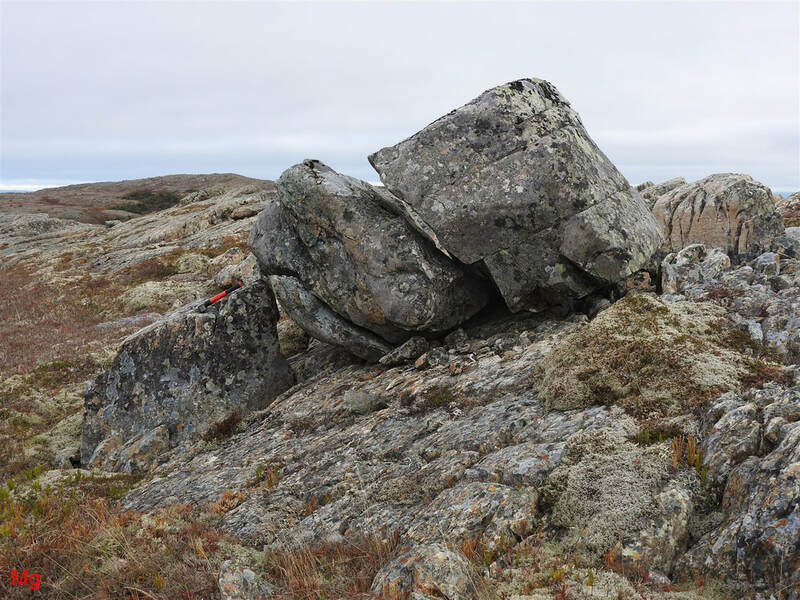 As seen in the above two photos, the erratic rests on small fragments of rotated and fractured frost-heaved bedrock. It is possible that the fragments seen beneath the erratic were crushed by direct contact with the boulder. However, loading of the fragments by moving glacial ice before the erratic arrived is an equally probable explanation for their present configuration. 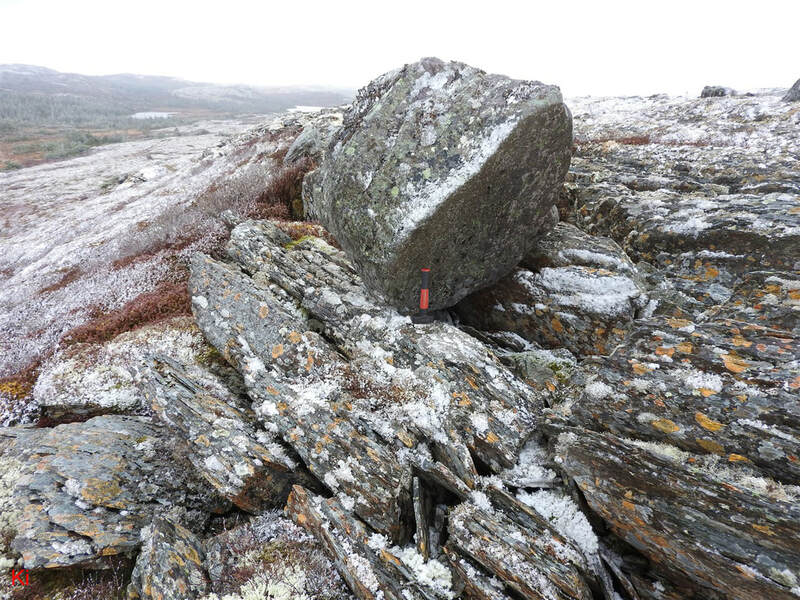 Observations of other fragments that are near the erratic and are rotated and/or broken in a similar manner suggest that moving surface ice loaded these fragments post frost-heave. 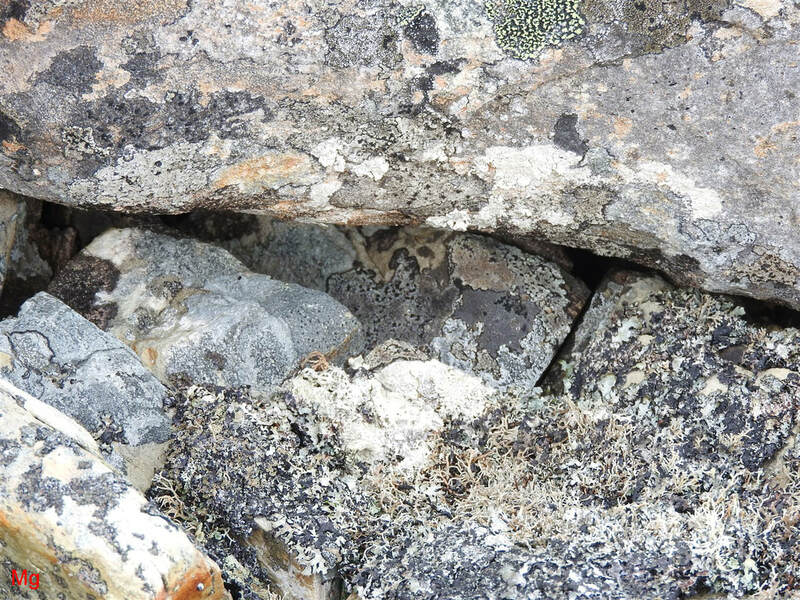 It would be unlikely for frost heave occurring in a subaerial environment to drive fragments beneath the boulder in a pattern such as is illustrated above. The illustrated occurrence of bedrock frost heave (Example 12) is thus likely of subglacial origin.